The Distracted Hermit - Page 8 of 8 - Martinis. Food. Culture. A Table for One. Martinis. Food. Culture. A Table for One. The Birth of a New Site. "I'll stick with gin. Champagne is just ginger ale that knows somebody." - Hawkeye Pierce, M.A.S.H. 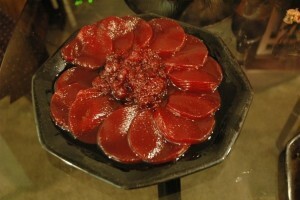 Thanksgiving 2009: A Medieval TV Dinner. Inspired by a series of Dutch Golden Age Still Life paintings, I became fascinated with the sometimes simple, sometimes complex oil paintings of feasts loaded with symbolism. 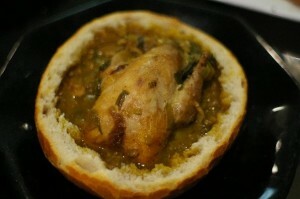 Meat pies topped with reconstructed birds such as peacocks, plates of raw oysters and simple breads, ales and overflowing piles of fruits. 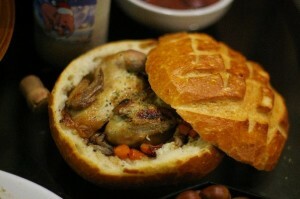 I created this as a culinary nod to the often elaborate meat pies and garnished meats: a game hen pottage nestled within its own bread bowl and covered. I selected several loaves of both sourdough and honey wheat, sliced them in half horizontally, and spooned the bread out to form hollow bowls. They were lightly toasted before the finished hen pottage was inserted, with the hen first followed by enough pottage to cover. 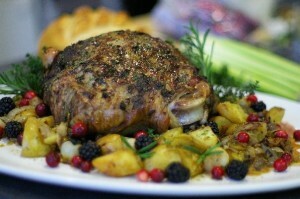 2009 Thanksgiving: Roast Leg of Lamb. Here was another dish for the table for Thanksgiving 2009, one of my favorites, an ambrosia for the nose and palate – roast leg of lamb. Sprinkling fresh fruit added a nice touch and worked as a palate cleanser. Thanksgiving 2008: A Lovely 2-Day Duck Confit Cassoulet. 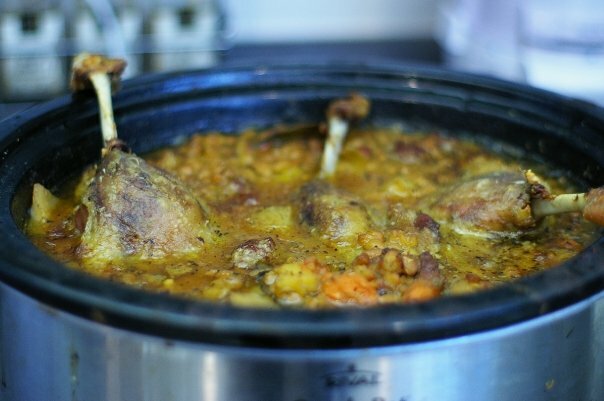 This cassoulet was prepared for Thanksgiving, and turned out rather nice. I had the luxury of duck confit legs for the occasion. Here’s an updated description on cooking this lengthy dish. 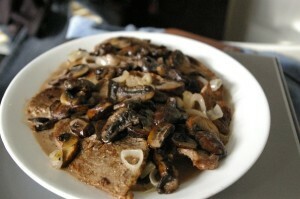 Sauteed Beef in Cream, Wine, and Mushrooms. Lovely French recipe. 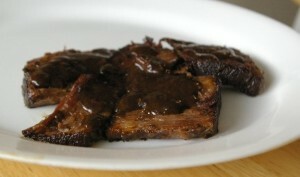 Beef Braised in Guinness Beer, topped in its finished sauce. Would be nice to try a Scottish Wee Heavy, or an Oatmeal Stout. 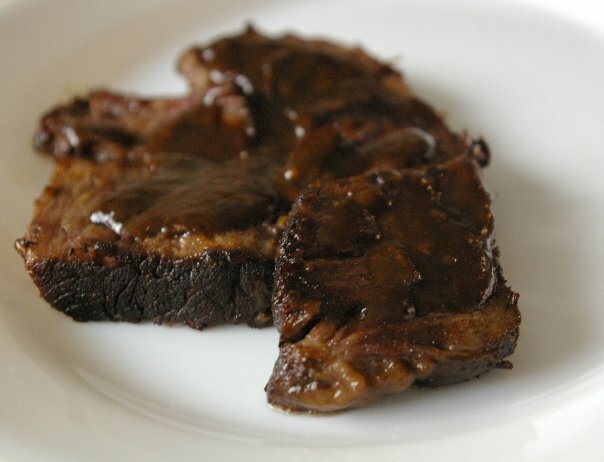 Guinness is excellent for an ultra dark, rich gravy. The bitter was countered with molasses & spices. 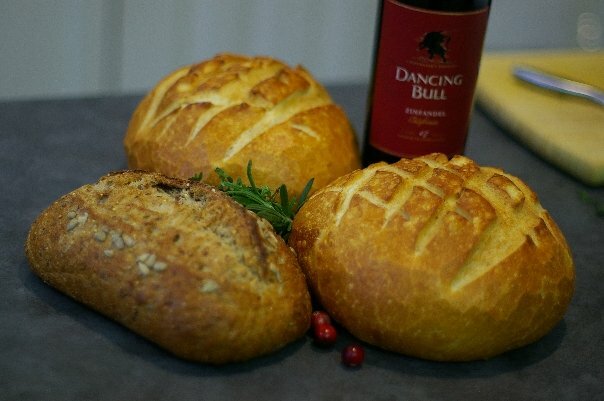 Recipe: Find a nice cut of roasting beef, cut into thick slices by hand or buy pre-sliced. Add slices to deep roasting pan in layers until 3/4 full. Add one bottle of dark or amber beer, several pulped cloves of garlic, a bit of thyme, salt, and a few tablespoons of brown sugar or molasses. Roast without lid, turning meat occasionally, at 375F until meat is tender and browned. Drain roasting fluids into a pan and finish into gravy with preferred thickener (flour, corn starch, beurre manie, roux) and extra brown sugar or molasses to counterbalance any brew bitterness. Serve. 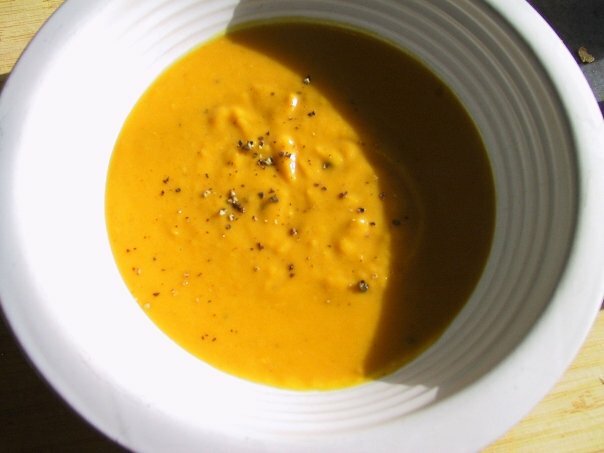 Here’s a lovely roasted pumpkin soup. 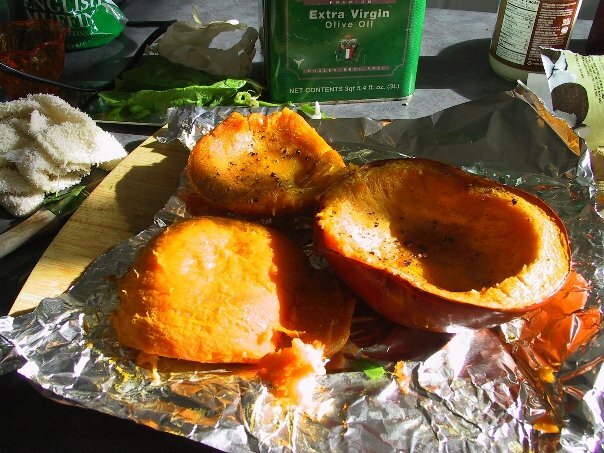 Recipe: Half and scrape clean a small pie pumpkin. Brush interior with olive oil, sprinkle with salt, cracked pepper, and insert 1-2 garlic cloves and a slice of ginger root. 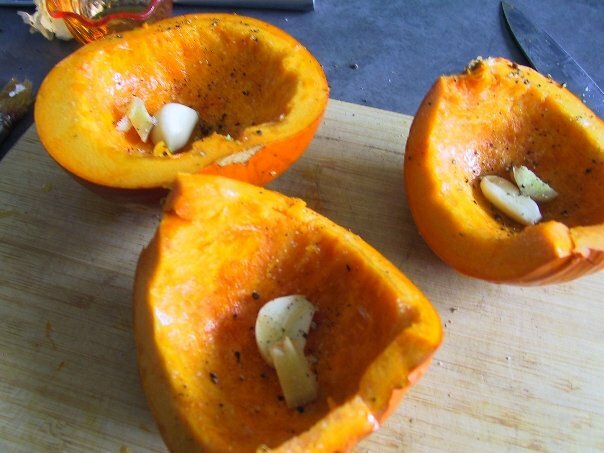 Place directly on oven rack and roast until fork pierces each easily. Allow to cool before peeling off skin. Add a few hot cups of your favorite broth, with an optional heavy dollop of cream, until desired consistency. Puree and heat gently on stovetop. Serve. Vodka Cranberry Sauce for the Holidays. And one day I thought, “Why not add some vodka to jazz up some ordinary canned cranberry sauce?” Just until I could taste it, of course. But, that’s the problem – you never do. That’s also the beauty of it. Keep away from children, and Hermit Safely. Champagne December, The First Seven Days: I’m Not Hiccuping. You’re Hiccuping.